Little Jacob O'Reilly's desire for a pet, and what he does about it, is a delightfully funny story told in verse and complemented with wonderful whimsical illustrations on every page. He asked for a dog but Dad didn't want fleas. He tried for a cat but the fur made Mom sneeze. 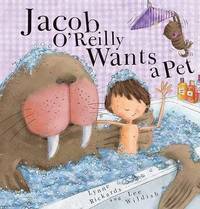 Young readers will giggle as they turn this book's pages and see the many different animals that Jacob O'Reilly is willing to adopt. If he can't have a dog or a cat, he'd be happy to settle for gerbils, or hamsters, or mice, or even an iguana--but Mom and Dad don't agree. Jacob's imagination runs wild when he visualizes himself as the owner of a giant emu--or a walrus. But the fun really starts when Mom and Dad allow Jacob to start up his own pet-sitting business. Suddenly, he has more pets than he can handle! Finally, at story's end, Jacob finds an unusual little pet that is all his own. Here's a laugh-filled tale for reading aloud to toddlers, or for early graders to enjoy reading by themselves. Color illustrations on every page.